Carl Draper, the Master Jailer, has imprisoned Lana Lang and Superman under Mount Olympus. He then reveals his plans to the red-haired WGBS anchorperson. He has placed Superman in what he calls the Eternity Cage, a cell from which there is no escape. He has placed special keys throughout this particular jail that will siphon the Man of Steel's�powers. These�devices are like the ones Draper used to "borrow" the superhuman abilities of the Atomic Skull, the Parasite and Metallo. Special energy receptors in his costume's gloves allowed the Master Jailer to use the three�villains' special gifts to build the hidden prison to trap Superman and be with the woman he loves - Lana Lang. Confused, Lana asks who Draper really is. She then realizes that he was a boy in Smallville High School with her and Clark Kent nicknamed "Moosie" Draper. Moosie was an overweight, clumsy lad who had been teased by his classmates. Only Lana had been nice to him, but she only had eyes for Superboy. One day, while Moosie and the rest of the Smallville High Senior Geology Club went spelunking outside of town, a cave-in occurred. The students had been trapped for over an hour. Moosie had slipped away determined to find a way out. Even as a boy, he was able to find any escape route, and this time was no exception. However, by the time he had returned to the group, Superboy had broken through the rock that had blocked the cave entrance. Moosie never mentioned the other exit, and nobody had noticed that he was gone. For twelve years, Carl Draper had struggled to rid himself of "Moosie." Diet, exercise and plastic surgery changed the way he had looked. He had a fascination for architecture, studied penology and became a master locksmith. This led to the creation of the Mount Olympus Correctional Facility, which he feels was upstaged by a certain Kryptonian launching it into the sky. It also planted the seeds for Draper's plan to keep Lana with him forever and to destroy the only thorn in his side - Superman. As for the Man of Steel, he has managed to escape a water trap and stop a hungry panther by blocking its carotid artery without killing it by using his cape. Even without his amazing powers, Superman has managed to even avoid a pit of anacondas. However, once the Last Son of Krypton reaches the deadly maze's exit, an energy blast erases his memory, and the turntable mechanism on which the labyrinth is built sends him back to the beginning. According to Draper, the Eternity Cage will do this�every time�Kal-El finds the way out. Superman will remain in the Master Jailer's prison forever. A masked Draper now is kissing Lana, and Superman is trying to piece together his memories and identity. While Draper is distracted, Lana hurls his power siphoning keyring into his monitors. Superman's power has been restored. The Man of Steel crashes through the prison walls into the Master Jailer's control room. A rock strikes Draper's head as the delusional man says that he's always loved Lana before�he�is turned over to the police. Since Lana's apartment was destroyed when the Master Jailer had captured her, Superman has reserved a suite for her at the Hotel Metropole. She thanks him and tries to be affectionate, but Kal-El says that she is making the same mistake with him that Carl Draper had made with her. When Lana had been in Europe, she never once wrote to Superman. Clark Kent, Lois Lane, Pete Ross or any of her other friends. They never knew if she was alive or dead, yet she had returned expecting things to be like old times as if nothing had happened. Lana has also gone to great lengths to "ace the competition" with Lois. Superman continues to speak with Lana. He will always be her friend and grateful for her helping him with the Master Jailer. However, the Last Son of Krypton believes that Lana Lang is only in love with what she thinks is the glory of being Mrs. Superman. With that, our hero flies away leaving a desperate Lana to ponder his words. Story - 3: Okay, we got the background information that I was hoping for in the conclusion of this two-parter. That's all well and good, but this chapter does drag a bit. Draper explains everything a little too much. 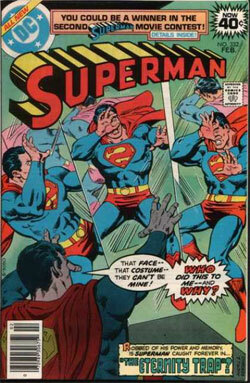 This tends to make one lose focus of Superman's attempting to escape the Eternity Cage. This issue could have easily had two pages of backstory while the rest of it could have shown Superman escaping from more traps. We see a total of two or three of the Master Jailer's escape prevention tricks. This makes him look like a second-rate villain toward the end of this issue. One question entered my mind when reading of Draper's school days in Smallville. Did Clark Kent also tease him? Considering the values that the Kents had instilled into him, I honestly find it hard to swallow if he did. However, Draper probably refuses to see this because of his obsession with Lana. The rest of Superman #332 is fairly good otherwise. There's a solution of sorts to the Lana/Lois rivalry and a lot of character driven drama, which seems to be a great strength for Martin Pasko. Something tells me that I'll see more of this as I continue his run on this book. I certainly hope so. Art - 4: Something about Superman doesn't look quite right when he starts fighting the panther on page nine, but otherwise, we have some really great Curt Swan art as usual. His visuals for the characters really show the emotion Pasko put into his scripting of them. Chiaramonte's inks really fit greatly with Swan's pencils. The team of Pasko/Swan/Chiaramonte really work well together. Cover Art - 3: I'm kind of on the fence with this one. On one hand, the artwork is great, but on the other, Andru's art is a bit overshadowed by the mirrors' effect on the eyes and Superman's dialogue balloon. The image is dramatic enough to make someone want to pick it up, but there is still room for improvement.